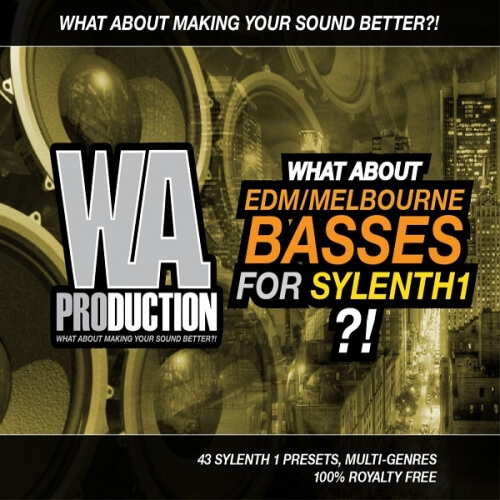 ‘What About: EDM Melbourne Basses For Sylenth1’ brings 43 of the biggest bass presets for all EDM and Melbourne Bounce producers. This fantastic soundset from W. A. Produciton contains the fattest and freshest bass sounds that can feed every drop to make it sound more killer than ever. Let’s bring some bass to your sound, just like the most famous EDM producers. Every sound is tweaked and compressed to give you the most powerful bass sounds that can Sylenth1 offer. Presets are divided into basses (34 sounds) and offbeat basses (nine Sounds) for all Melbourne Bouncers to offer you the most complex bass synths soundset.